This reference is given from " The complete book of Palmistry" by Joyce Wilson. It is on number 12 ranking at Amazon Sales List. 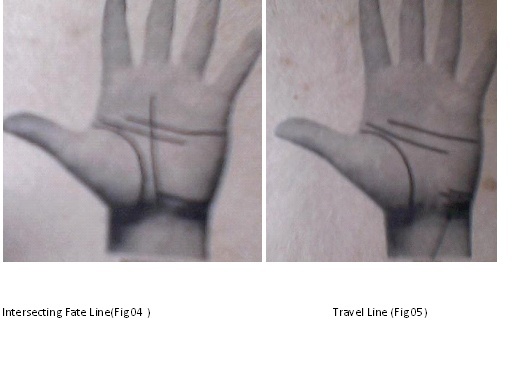 Travel Lines ( Figure 05) start on the edge of the palm the heel of the hand, opposite the thumb. One well- marked travel line shows that you will travel far to make your home in a new location. Usually, travel lines show major journeys - overseas, cross country or those that have a profound effect on the life. Length and strength of the lines show the distance traveled and the importance of the trip. Interesting observations of the author indeed. And Thanks for presenting this details with illustrations. Have the timing of travels explained in this book in association with the travel lines? please go through following link ( page # 02) 12 Oct 2010 posts. I would like to share almost 3 to 4 authors experience and research about Travel Lines in this topic.It may help general users and experts both. We come across several lines from the mount of Moon which has different functions. The lines go in various directions and from the nature of the line we can distinguish its function. The lines on the mount of moon mainly have three functions. (1.) They show the travels or the voyages. (2. )They indicate the diseases according to the place on the mount of Moon where they are found. (3. )They show the influence of other persons in the career of the individual. We shall discuss below the above aspects one by one. Certain lines on the mount of Moon also show such voyages or travels. 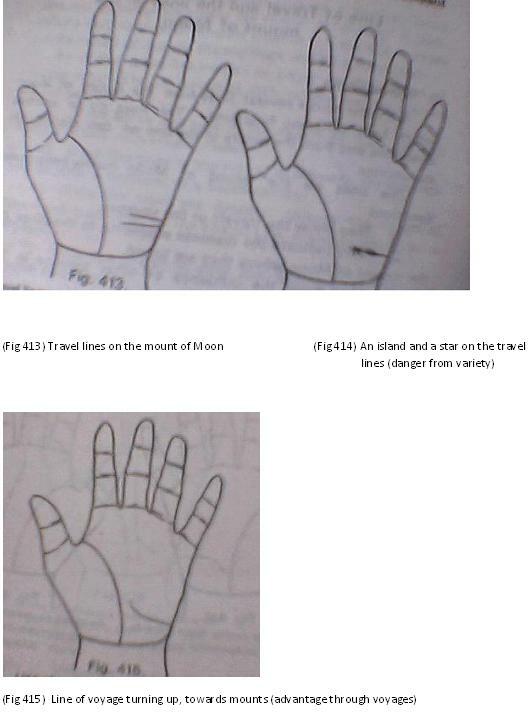 Horizontal lines or cross lines from the centre of the mount of Moon generally indicate travel or voyages ( fig 413 ) Such lines usually start from the percussion and run towards the interior of the palm and, if the line is longer, the person will go on a long voyage and vice versa. A line falling out from the life line and going to the mount of Moon is also a line of travel. Sign on the travel line. (c) A square, as we know, is a sign of preservation and the person is protected from danger if any during the journey. 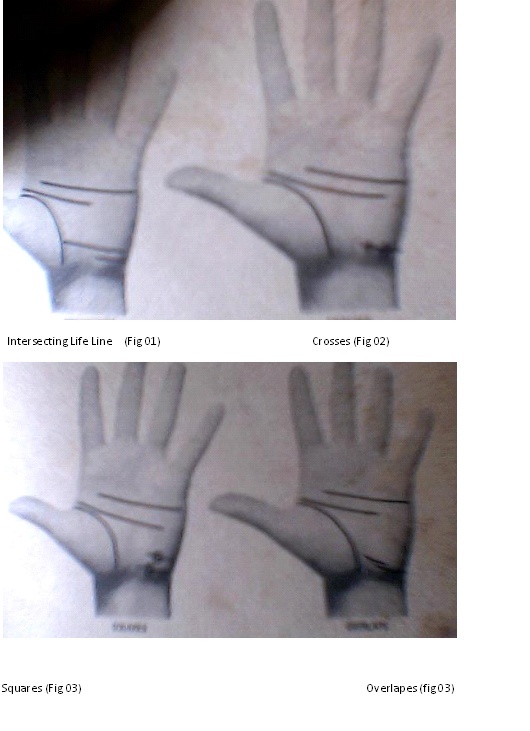 If the above signs are seen on both the hands, the danger is sure but if they are seen only on the left hand and not on the right hand, they indicate only the possibility of such dangers, with a square on the line of voyage on the right hand, the person is sure to be saved and protected from the danger, even though he is liable to meet with an accident. (a)	If the voyage line turns up at its termination and shows direction towards the mount of Jupiter or the mount of sun or the mount of Mercury or to the mount of Mars, the person will gain an advantage by the voyage ( fig 415) the nature of the advantage is shown according to the mount towards which the line points. (b)	If the line points out to the mount of Saturn, the voyage will seldom bring advantageous. (c) In case the line of voyage turns up and joins the line of Heart, the person will come across one who will influence his affections. (d) If the line of voyage turns up and joins the line of Head, the influence will be of business nature. (e) If the line of voyage turns down and joins the line of life (fig 416) the journey wull end in disappointment of fatality. The book looks like another I will try and buy to add to my collection. There is also the strongly curved shape of the percussion side of the hand which increases the desire for travel and water... often seen in people who are captains and crew of ships etc. Sometimes a fork on the percussion side of the travel line has been linked to astral traveling or the dreams that wake you up by making you feel you are falling. Thanks for the interesting post.Reference to fig 413, I strongly agree that the travel line appearing on the mount of Moon means travel(like in fig 413).The same line appears in my hand clearly. My job demands a lot of travel and I keep moving cross country.You might be knowing India is a big country and since one and half years,the line has appeared distinctly in my hand and I have traveled the length and breath of India. To verify in other cases,I am a travelling marketeer and my colleagues have the same job profile like mine. In all of their palms,the same line appears although somewhat differently. Some have been in long voyages abroad. But I could not find any such travel line,although some lines appear to start from the mount of moon and goes towards the fate line. Experts may help on Travel lines more with their experiences. Thanks Felicity Martin and Raman both of you. I have seen those people hand they do not have travel line but toured many countries. Some of them persons' fate line is start from Moon mount and some person's fate line starts from wrist corner. One of my client has no travel line but his Moon mount is visible and pink color, his whole palm is soft and has square hand, he traveled more than 30 countries. The Via Lasciva line also runs from the mount of moon, this is generally an allergy line, but some people even today read it as travel does anyone here read this line?? godo wrote: The Via Lasciva line also runs from the mount of moon, this is generally an allergy line, but some people even today read it as travel does anyone here read this line?? Thank you for you useful comment - I had the same thought myself while reading Asif's posted materials. But basically, a typical 'Via Lascivia' doesn't start at the side of the palm; while a typical 'travel line' should really reach out to the side of the palm. I hope this provides you a specific criterium to discriminate a rather common travel line from a 'Via Lasivia' (which is more rare). Martijn (admin) wrote: But basically, a typical 'Via Lascivia' doesn't start at the side of the palm; while a typical 'travel line' should really reach out to the side of the palm. I hope this provides you a specific criterium to discriminate a rather common travel line from a 'Via Lasivia' (which is more rare). oh, I didn't know that via lasciva doesn't typically start at the ulna edge of the palm, nor that it was more rare. What is your source for this? I have never read this info before. Well Lynn... I described this based on my observations & experience. I am not sure that any author has even tried to describe the difference between those lines. PS. Horizontal lines at the ulnar edge of the palm are relatively common (far most people have a few of those line, though these lines are not always very long). But a true Via Lascivia is far less common (I have no statistics available but my estimate would be that one can observe it in far less than a quarter of people, possibly even close to 10%, maybe even less - depending on the criteria used to recognize the line; recently I mentioned that Ed Campbell's 'The Encyclopedia of Palmistry' informs us that over the years palmistry authors have used completely different descriptions to describe the Via Lascivia). Yes, Mr. Martijin is right this line Via Lascivia is seldom seen on the hand. As you have studied Mars Line is a sister line to Life. Accordingly, I consider this is a sister line to the Liver Line, because it starts almost at the same place and terminate at the same place almost in the same manner and place as it is a Liver Line. The name is derived from the word ‘lascivious’ of course. So, this line should be find in the hand of the persons who has abundance of vitality and physical energy, good health who is much interested in or indulging in such activities, the lascivious practices. While The Travel Lines start from the edge of the palm at the heel, opposite the thumb, and extend horizontally. Travel Lines are the indicator of the trips taken throughout the life and their impacts on life. These are frequently seen comparing to Via Lascivia. Nice to see that you made likewise observations regarding the differences between the so-called 'Via Lascivia' and the more common 'travel lines'. PS. I could like to add that I prefer to label the last ones with a less suggestive - more neutral - name, because I think the name 'travel lines' is just another example of folklore. Allergy,Via lasciva,intensity and short and freequent travellings,all need to be differenciated in this regard! This is the book I thin I should have never purchased! Money does not matter but the time I spent does really matter ofr me. asif amin wrote: Thanks Felicity Martin and Raman both of you. Yes, Allergy lines starts on lower Mount of Moon and end at some upper part of Moon where a Via Lascivia can be considered a sister line to the Liver Line, because it starts almost at the same place and terminate at the same place almost in the same manner and place as it is a Liver Line. Allergy lines are very fine and thin. These must not be taken as Travel Lines or Voyage Lines either because these are little offshoots or branches from Life Line and proceeds into the Mount of Moon or vice versa and read to indicate journeys. Independent small lines on the Mount of Moon also denote voyages but they are just horizontal and Mount of Moon is known for restlessness and imagination. so will insanity or degeneracy destroy my life??? This article states "If the Line of Head is found weak-looking, full of islands and escending downwards on the Mount of the Moon, insanity or the worst form of degeneracy will sooner or later destroy the whole character and career." I'm pretty sure I have the Via Lascivia line, and my head line does curve down into Moon, and it has islands and 1/4 chained in the beginning. Does that mean I can look forward to the worst form of degeneracy? No, definitely no because the short essay is incomplete because this neither gives right information about the line -i.e. about its starting point, its course and its ending- nor gives proper meaning about this line. The person who possesses this want to live passionately enjoying life because this shows the person has abundance of vitality and physical energy, good health who may be much interested in or indulging in such activities, the lascivious practices of course. The Head Line will decide the course or consequences that whether the the passion is controlled or uncontrolled. Hand must be analyzed in totality. Further more on it. This line indicates person’s involvement in somewhat ‘lower operations in lower world’ of course. This will be so, particularly, if the person has the signs of being a voluptuary. Then be sure that this line if present in the hand will be a great obstruction to his/her progress in the world or to a career. His or her appetite will be above the normal. He/she searches ways to undone his abundance of energy and goes where pleasure is. Much diet and drinking and excess in satisfying his earnest desire in the field will affect his health, ultimately his brain. This can cause defects in the Head Line or Fate Line. See, if there is island in the Fate Line ahead, this will cause financial losses and difficulties. Person usually found addicted to luxury and pleasures of senses, without doubt.